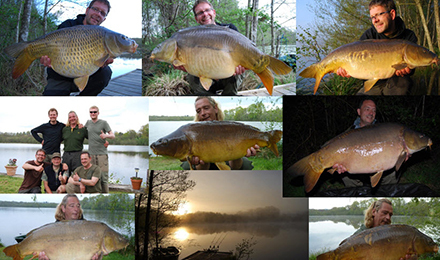 "Badgers Holt continued to fish really well with Klaus Wegmann and Phil Braun from Germany ending up with 25 carp. It was the session of a lifetime for Klaus with his big common of 26kg (57lb 2oz)... as previously reported. Klaus went on to land a string of big fish including a number of mirrors well over 20kg (44lb). Phil also caught a lot of fish including a number over 20kg. Phil was filming for part 2 of his DVD "Phil in France". The filming was excellent with a lot of live footage showing big fish being played, netted and weighed. Phil also goes into detail about his rigs and tactics that again proved successful at this sometimes tricky water. Many of the photos of this week's Badgers Holt fish will be released by Phil and Klaus in the run of time as part of the DVD and in magazine articles, etc. Part 2 of the DVD will be something special and highly recommended! Today we carried out the first cutting back of the lily pads of the year which will help with landing fish over the next weeks. We plan to keep these under control throughout the season."